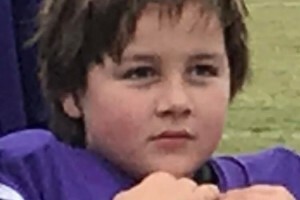 If the first 24 hours are any indication, the online campaign to raise funds for Northern Guilford Elementary School third-grader Ashton Bates will reach its goal by the end of April. Ashton’s journey back to health, though, is just beginning. Ashton Bates plays football for the Northern guilford Nighthawks. Approximately two weeks ago. Ashton was taken to Brenner’s Childrens Hospital in Winston-Salem and diagnosed with AML Leukemia. Within the past 10 days, he started undergoing chemotherapy. Clinton Bates began the online GoFundMe campaign on March 30. Family and friends have helped to raise $2,475 in a single day. The goal is to raise $50,000. 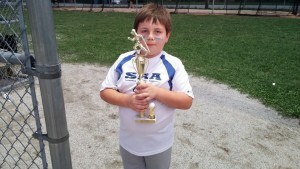 Ashton Bates clutches a trophy earned while playing for the Summerfield Recreation Association baseball league.